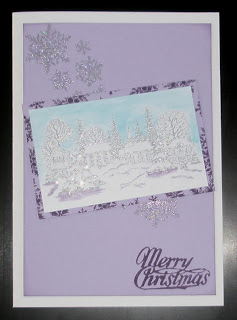 I spotted the challenge over on The Artful Times blog and thought it would make me create another Christmas card. 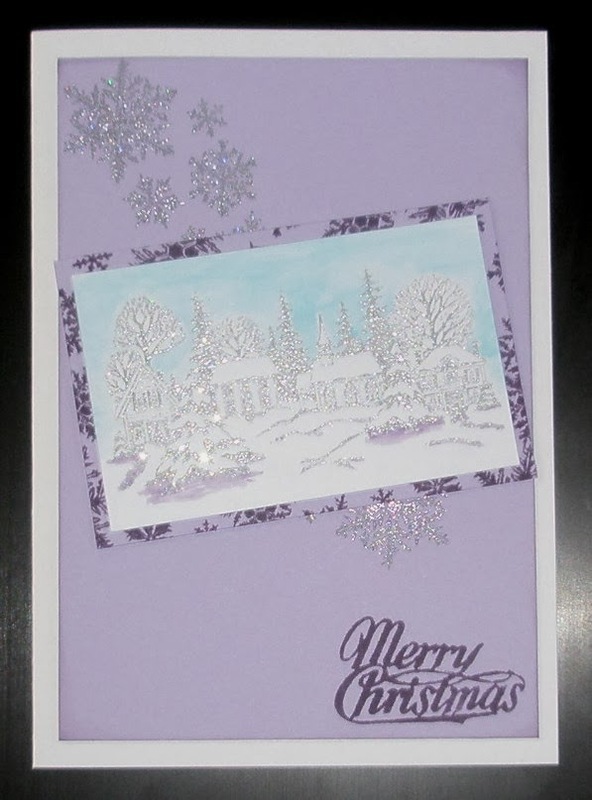 The challenge is to use Lilac and Silver with a Wintry Scene. I immediately decided to use my favourite wintery stamp - the PSX Winter Village - inked with Silver Versacolor and embossed with Holographic Super Sparkle powder. I've added a little more detail with watercoloured Broken China and Dusty Concord Distress Inks. For the mat I've stamped Tim Holtz's Snowflakes in Dusty Concord and again for the background stamped in Silver Versacolour and Holographic Super Sparkle powder. It's just finished with the Merry Christmas from another Tim Holtz set. I hope you can see the detail in the snowy village - it was a devil to photo but that may have been the fault of the sparkley powder......but it is for Christmas! Thanks for the challenge - I'm off to see what everyone else has done!! Fabulous card Elaine loving the sparkle. Hi,beautiful card,I love this lilla colour! Fabulous sparkley village, great card. That winter village stamp is just gorg Elaine. Beautiful card. Love your wintry scene. Thanks for joining us - sorry I am so late.